Football Weekend Accommodations . . .
Only ONE WEEKEND remains open for accommodations aboard the KokOasis during the 2018 football season – Homecoming vs UNC Charlotte (Nov 3). Docked under a covered slip adjacent to Ruth’s Chris Steak House and downtown Knoxville, this beautiful 75-foot Sharpe Houseboat is very roomy on the inside with lots of bonus space on the roof! Central heat and air conditioning provide cozy comfort all year round. Three staterooms, 2 full baths, a fully appointed kitchen, and a large hot tub on the upper deck provide additional comfort and convenience. 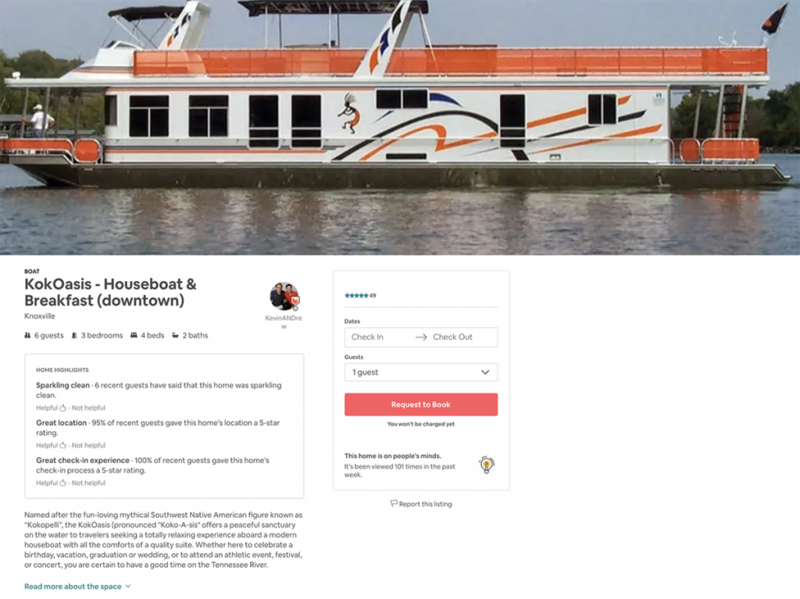 Secure your football weekend stay aboard the KokOasis through Airbnb at KokOasis.com. The vessel remains docked at the marina throughout your stay, just a short 10-15 minute walk along the river past the VOL Navy to Neyland Stadium. This entry was posted in Uncategorized by Harbormaster. Bookmark the permalink. The Harbormaster is here to assist Members in successfully navigating the waters of this site. If you are experiencing any difficulty in viewing or posting information at this site, please let him know.